It's fun and easy with trendy Scratchin' Fashion art activity books. Simply scratch designs on magical tattoo stickers. Stick them on fashion pictures to complete the cool collection. Whether your style is funky or sweet, preppy or glam, you can customize fun fashion pages with your very own totally cute multicolor tattoo designs. 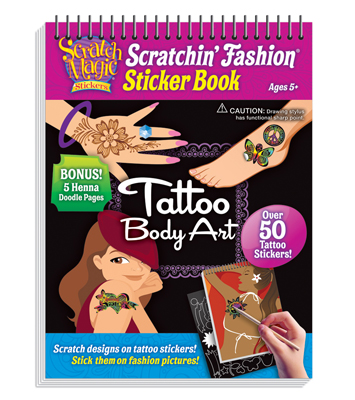 Each book includes 15 fashion picture sticker pages, plus over 50 Scratchin Fashion Stickers, and a wood stylus. For extra-fun, five bonus pages are included featuring 5 henna design doodle pages totaling 20 fun fashion activity pages in all! Safe! Clean! 100% fun.